Home CDN , children , crafts , feature , holiday , holidays , homeschool , January , papercrafts , printables , US , worldwide January 7th - Harlem Globetrotters Freebies! January 7th - Harlem Globetrotters Freebies! -- Basketball promoter Abe Saperstein's New York Globetrotters took the floor on this date in 1927 at Hinckley, IL. Despite the New York in their name, the Globetrotters (who included Inman Jackson, Lester Johnson and Walter Wright) hailed from Chicago's South Side. The talented African-American players — unable to play in white professional leagues — barnstormed the nation in serious basketball promotional events. They changed to Harlem Globetrotters in the 1930s and added humor to their games in the 1940s. 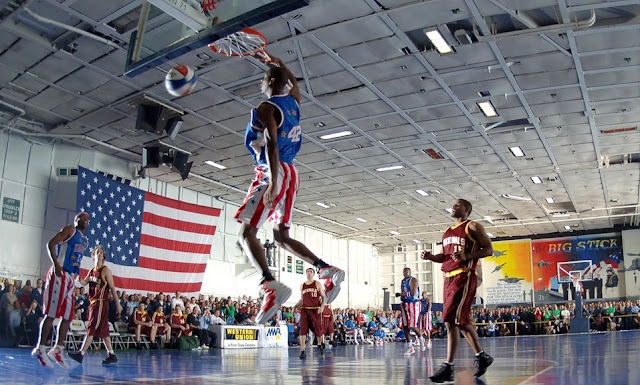 -- Did you know that the Harlem Globetrotters were originally from Chicago? Or that this incredible team paved the way for many innovations in basketball and the world of professional sports? Now you can get courtside seats to the best game in town and become a History of Fun Stuff Expert on the Harlem Globetrotters! • 1972 Harlem Globetrotters -- Metal sign with simulated rusted edges and scratched and faded paint. It has smooth rounded corners and includes pre-drilled mounting holes. Suitable for indoor or outdoor use, this sign is weatherproof and won't fade in the sun for many years. Perfect for kitchens, bathrooms, doors, garages, man caves, cubicle walls -- any place you'd like smaller, very unique signs. • Bathtub Basketball Hoop -- It's never too early to start practicing! With the Harlem Globetrotters Scrub-a-Dunk, your little All-Star will be smiling and swishing baskets from day one! Made of durable ABS plastic, attaches securely to the wall of your bathtub or shower using two included suction cup mounts. No assembly required! Fun for all ages. - For decades, programmers have made major contributions to our lives. Programmers are ultimately responsible for many of the conveniences we enjoy such as DVR, direct deposit, web surfing, online bill paying, cell phones, etc. Behind most modern-day convenience, there's a computer programmer. - This delicious Japanese style of cooking lightly batters and fried vegetables and seafood. It was first introduced in Southern Japan during the mid-sixteenth century by early Portuguese missionaries and traders. To celebrate, try making your own tempura at home or head out to your favorite Japanese restaurant! - A day to fight back and take control of all events happening in one's life. Stand up for your rights - it is so easy to walk away. - Any Orthodox Christians in the United States celebrate Christmas Day on or near January 7th in the Gregorian calendar. This date works to be December 25 in the Julian calendar, which pre-dates the Gregorian calendar. It is a time to celebrate the birth of Jesus Christ, who is believed to be the son of God. - Flash Gordon is the hero of a science fiction adventure comic strip originally drawn by Alex Raymond, which was first published on January 7, 1934. The strip was inspired by and created to compete with the already established Buck Rogers adventure strip. - The comic strip, titled Buck Rogers in the 25th Century , debuted on January 7, 1929, with the character now called by his nickname. It ran consecutively until 1967, and at its peak was published in more than 400 newspapers throughout the world and translated into 18 languages. - An opportunity to enjoy and appreciate old rocks and fossils. Perhaps you can start a rock collection. You can go out on a field trip in search of old fossils (the rock kind)Or, if you choose, you can just play with old rocks.